We live and breathe rugby. This book celebrates the Springbok teams that really knew how to pump the air into our rugby lungs – the greatest South African rugby teams ever. Inside these pages are profiles and statistics of the players and teams who smashed the All Blacks and Australia in their own backyards in 1937, the conquerors of Europe in 1951/52, those who faced the hungry British Lions in 1924, 1980 and 2009, the Boks who lifted the World Cup in 1995 and 2007, plus many other great sides. The teams featured are the best of the best. From 1924 to the present day, from the amateur players of old who went to fight in the World Wars to the modern professionals who moved into business or became TV pundits, the author delves deep to find out what happened to the unforgettable names who made up these great sides. And what does it really mean to be part of one of those great Springbok teams? The book includes interviews with Morné du Plessis, Rob Louw, Victor Matfield and John Smit, who reveal what’s behind the magic of the green and gold. 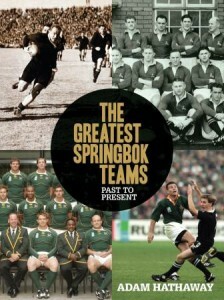 The Greatest Springbok Teams – Past to Present celebrates those Springbok teams that have become truly immortal in the eyes of their fans – it is a must-have for every rugby library. Adam Hathaway is an international rugby writer who has written for publications around the world. He has covered more than 10 rugby tours, including the last three World Cups, and has written about every major rugby nation. He is the former rugby correspondent for the News of the World in London and currently writes about rugby for the Sunday People. Adam is the chairman of the Rugby Union Writers’ Club and has co-authored A Fan’s Guide to World Rugby and The Little Book of Rugby, and he has contributed to other books, including Behind the Lions and The Rugby Revolution.